4723. Mark H SWEIGART (Grace Dora BITLER , Milton Henry , Benjamin Israel , Mark , John , Johannes ) was born on 14 Jul 1921 in PA. He died on 16 Feb 1964. Mark resided in 1930 in Eyers Grove, Greenwood Twp, Columbia Co, PA. He resided in 1940 in Nescopeck Twp, Luzerne Co, PA.
Mark married June Alice DIEHL, daughter of Henry Orval DIEHL and Edith E SPAIDE, about 1943 in Columbia Co, PA. June was born in 1925 in Mifflin Twp, Columbia Co, PA. She died on 7 Feb 1949. 9267 F i [Female] SWEIGART. Mark also married Kathleen ECKENROTH in 1950. 9268 M ii [Male] SWEIGART. 9269 F iii [Female] SWEIGART. 9270 M iv [Male] SWEIGART. 9271 F v [Female] SWEIGART. 9272 F vi [Female] SWEIGART. 4725. Sara Louise SEELY 1, 2 (Nettie Ida BITLER , Milton Henry , Benjamin Israel , Mark , John , Johannes ) was born on 18 Jul 1931 in Berwick, Columbia Co, PA. She died on 20 Oct 1988 in Miami, Dade Co, FL. Sara was issued a social security number before 1951 in NY. Sara married [Male] NAGY about 1953. 9273 F i Jane Louise NAGY. + 9274 F ii Janet NAGY. 4726. Audrey Dawn SEELY (Nettie Ida BITLER , Milton Henry , Benjamin Israel , Mark , John , Johannes ). Audrey married Anthony P DELULIIS, son of Pietro DEIULIIS and Elizabeth MANEIRI. Anthony was born on 29 Oct 1921 in Altoona, Blair Co, PA. He died on 14 Sep 1998 in Centre Community Hospital, State College, Centre Co, PA. He was buried on 17 Sep 1998 in Calvary Cemetery Mausoleum, Altoona, Blair Co, PA.
Anthony worked as Welder with Conrail from 1941 to 29 Oct 1981. He served in the military with U.S. Army in WW II (South Pacific and Germany). He was issued a social security number before 1951 in PA. He is a member of St. Rose of Lima Catholic Church in Altoona, PA. He was a member of Catholic War Veterans. He was a member of American Legion, Iaia Post. He was a member of United Veterans Association Club. He resides in Sep 1998 in 101 59th St, Altoona, Blair Co, PA.
9275 F i Paige Elizabeth DEIULIIS. + 9276 M ii Todd Anthony DEIULIIS. 4727. Dallas Clinton BITLER 1 (Mark Loren , Milton Henry , Benjamin Israel , Mark , John , Johannes ) was born on 4 May 1928 in Millville, Columbia Co, PA. He died on 26 May 1981 in Unityville, Lycoming Co, PA. He was buried in Gordners Grove Cemetery, Lycoming Co, PA.
Dallas resided in 1930 in Millville, Columbia Co, PA. He was issued a social security number before 1951 in PA. He resided in Jan 1951 in Tulsa, OK. He resided in 1981 in Unityville, Lycoming Co, PA.
Dallas married Grace PICKARD about 1950. + 9277 M i David Woodrow BITLER. 4728. Janet Paige BITLER (Mark Loren , Milton Henry , Benjamin Israel , Mark , John , Johannes ). Janet married John H SNYDER. 9278 F i [F] SNYDER. 9279 F ii [F] SNYDER. 4729. Dorthy Jane BITLER (Mark Loren , Milton Henry , Benjamin Israel , Mark , John , Johannes ). 9280 F i Holly WHITMOYER. 9281 M ii Brian WHITMOYER. 9282 F iii Kelly WHITMOYER. 4732. John C BITLER (Roy Wallace , Wilson Robert , Benjamin Israel , Mark , John , Johannes ). John married Dorothy F SCHRACK. + 9283 M i Shelley Gene BITLER. 9284 M ii Malone D BITLER. + 9285 F iii Tammy L BITLER. 9286 M iv Joseph "Joey" BITLER. 4733. Nancy M BITLER 1 (Roy Wallace , Wilson Robert , Benjamin Israel , Mark , John , Johannes ) was born in Jan 1934 in PA. She died on 18 Dec 2000. Nancy resided in 1935 in Columbia Co, PA. She resided in 1940 in Star Route Thornton, Lehigh Twp, Lackawana Co, PA.
Nancy married Clarence D KOCH 1, son of Lawrence D KOCH and Alta LAYLON, in 1952 in Lycoming Co, PA. Clarence was born on 16 May 1931 in Muncy, Lycoming Co, PA. He died on 11 Apr 2007 in Muncy, Lycoming Co, PA. He was buried on 14 Apr 2007 in Green Lawn Memorial Park, RR2, Montgomery, Lycoming Co, PA.
Clarence was a member of Moreland Community Church. He graduated from Muncy High School. He worked as Pipe Fitter with Avco Lycoming Textron from 1952 to 1991 in Williamsport, PA. He was a member of Williamsport Chapter U.A.W.. He was a member of N.R.A..
9287 F i Donna KOCH. 9288 F ii Gloria M KOCH. Gloria married Michael C BUTZ "Mike". 9289 M iii Danny KOCH. 9290 F iv Charlene M KOCH. Charlene married Terry J ANSELMO. 9291 M v Brian KOCH. 9292 M vi Rodney D KOCH. 4734. Dorothy BITLER (Roy Wallace , Wilson Robert , Benjamin Israel , Mark , John , Johannes ). Dorothy married Charles PRICE "Chuck". 9293 F i Laurie PRICE. 4736. Thomas Wilson BITLER (Roy Wallace , Wilson Robert , Benjamin Israel , Mark , John , Johannes ). Thomas married Ruby M EDWARDS. + 9294 M i David Lee BITLER. + 9295 M ii [Male] BITLER. 4741. Donald G BITLER 1 (Grant C , Wilson Robert , Benjamin Israel , Mark , John , Johannes ) was born on 27 Jan 1922. He died in Mar 1976. Donald resided in 1930 in 1313 West Front St, Berwick, Columbia Co, PA. He resided in 1940 in 1313 West Front St, Berwick, Columbia Co, PA. He served in the military with on 5 Nov 1942. He was issued a social security number before 1951 in PA. He resided in Mar 1976 in Berwick, Columbia Co, PA. He worked as Restauranteer. Donald married Martha Jean ENT "Jean" 1. Jean was born on 17 Nov 1920. She died in Nov 1979. Jean resided in Nov 1979 in Berwick, Columbia Co, PA.
Janis K BITLER 1 was born on 8 Mar 1949 in Berwick, Columbia Co, PA. She died on 12 Aug 2010 in Loving Care Nursing Center, Selinsgrove, Snyder Co, PA. She was buried in Pine Grove Cemetery, Berwick, Columbia Co, PA.
Janis resided in East Front St, Berwick, Columbia Co, PA. She worked with Bitler's Restaurant in Berwick, PA. She was a member of First Reformed United Church of Christ in Berwick, PA. She resided from 2000 to Aug 2010 in Loving Care Nursing Center, Selinsgrove, Snyder Co, PA.
9297 M ii Brian D BITLER. 4742. Phyllis BITLER (James Milton , Wilson Robert , Benjamin Israel , Mark , John , Johannes ). Phyllis married Howard L HEACOCK [scrapbook], son of Orville E HEACOCK and Rena Claire EVES. Howard was born on 27 Aug 1913. He died on 13 Mar 1997. He was buried in Pine Center Cemetery, Pine Twp, Columbia Co, PA.
Howard resides in 1920 in Greenwood Twp, Columbia Co, PA. He resides in 1930 in Upper Rd, Greenwood Twp, Columbia Co, PA. He was issued a social security number before 1951 in PA. 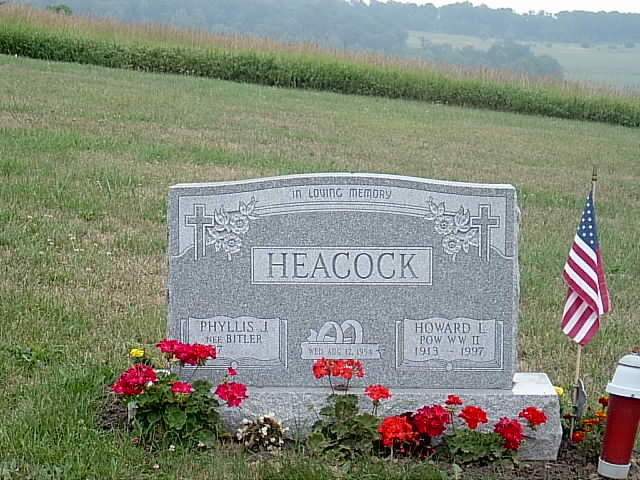 He resides in Mar 1997 in Millville, Columbia Co, PA.
9298 F i Donna HEACOCK. Donna married Kermit MANTZ Jr.